Spring is here. Have you thought of foie gras? The swallows are back. Now that the nice weather is here again, it's wonderful to be able to enjoy your garden or balcony, to eat at a café or on a restaurant terrace! 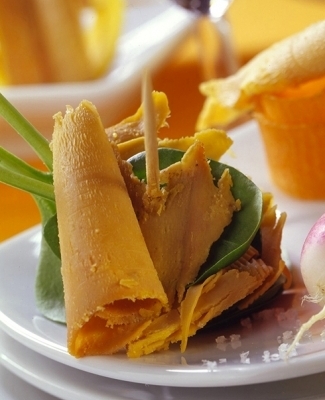 It makes you want to have a brunch or barbecue with friends, to eat in the county and picnic with your family...Why not enjoy some foie gras? You can eat foie gras in the springtime too! Many people believe that this symbol of French culinary art can only be eaten for the year-end holidays or for special occasions like weddings. But, you can eat foie gras all year round and on any occasion. You can eat it on toast, in a verrine, in a salad or as a main course. There are many different recipes perfect for every occasion. Foie gras, like duck breast, goes well with sweet and savoury combinations. The delicate taste of foie gras goes beautifully with the subtle aromas of spring fruit. Its melt-in-the-mouth texture blends wonderfully with red berries and mango. Foie gras also goes very well with young spring vegetables like asparagus, beets, celery and radishes. To celebrate the return of spring, foie gras producers invite you to discover delicious foie gras recipes that subtly combine foie gras with seasonal fruit and vegetables. These springtime recipes are easy to prepare and are sure to win over the taste buds of gourmets!